After a reasonable sleep it was time to fill up on the all you can eat breakfast buffet at Coldfoot Camp and pack the bikes. With Deadhorse and Coldfoot out of the way Rob and I felt we were well and truly on our way home. The route back to Anchorage though was not as direct as the way here. Everyone was dragging the chain a little today, it’d been a few tough days on the road and the unfortunate incident yesterday was still on our minds. 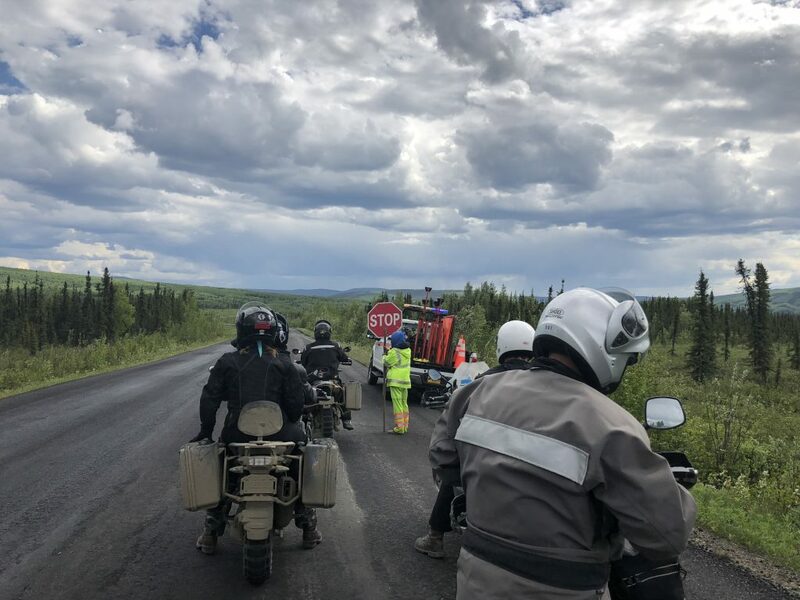 The first part of the route though was back to Yukon River Camp, about 190 kms for fuel and lunch. The wet wether that had been around yesterday was gone and even though it was the same road we’d ridden up on only two days before it felt completely different. Not only the gravel sections but the tar sections seemed to have deteriorated even further in such a short time. There was roadworks of course. The lollypop man at the first one told us it’d be a while so I got to help him out. I’ve always wanted to do this! 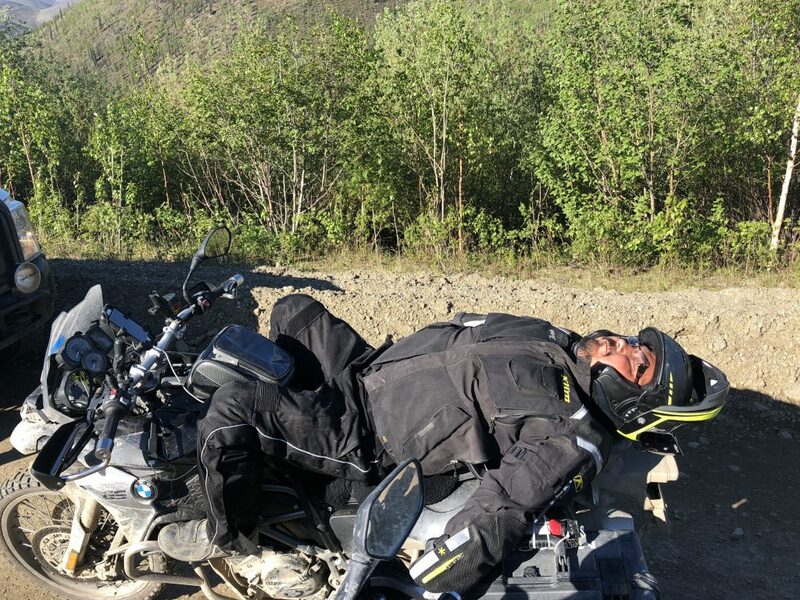 Dan from Motoquest, who spent time checking bikes, oiling chains etc while we were all sleeping decided to take a moment to meditate. Once through that Rob and I pushed ahead. There were a lot of trucks on the road today going in both directions. In many of the gravel sections the piles of stones seemed deeper and the potholes on the tar also seemed to have grown in size and depth. For a while I was in front and using the bluetooth intercom to warn Rob of hazards. It seemed incessant and we decided to run silent for a while and get back to our respective audio books. A couple of times my bike nearly got swallowed up by potholes that went right across the road. Big, uncomfortable hits disguised by trucks in front and making it challenging to pass. The gravel sections became a welcome break. For one reason or another it didn’t seem like a day to enjoy the views so there’s a shortage of scenic shots. I hit a particularly deep and nasty pothole that actually ran the full width of the road. This was definitely not there two days before. I’d been running normal road pressures on the AT’s shinkos and I’m glad I did. Rob hit the same pothole and hit it hard on the heavier GS. After a short while I noticed he wasn’t behind me so I waited. He’d jarred his wrist and was in a fair amount of pain. He went in front for a while and then while we were following a truck looking for an opportunity to overtake it we were peppered by another series of big potholes. The conversation on the Sena’s was definitely censorable. A little while after that I noticed Rob’s left pannier was looking very loose and I told him to pull over. The Africa Twin had been showing signs of fork seal issues over the last couple of days was now haemorrhaging fork oil. Rob had two dented rims and broken at least one spoke on the front wheel. The very sturdy pannier racks had deformed significantly and a weld on the left side rack had broken. The others showed up a short time later, everyone had comments to make about the road. A little while later the support truck pulled up. We did what we could to put Rob’s bike back together, a pretty good job really, and forged ahead. Fortunately it didn’t appear that Rob’s bent rims were leaking air. 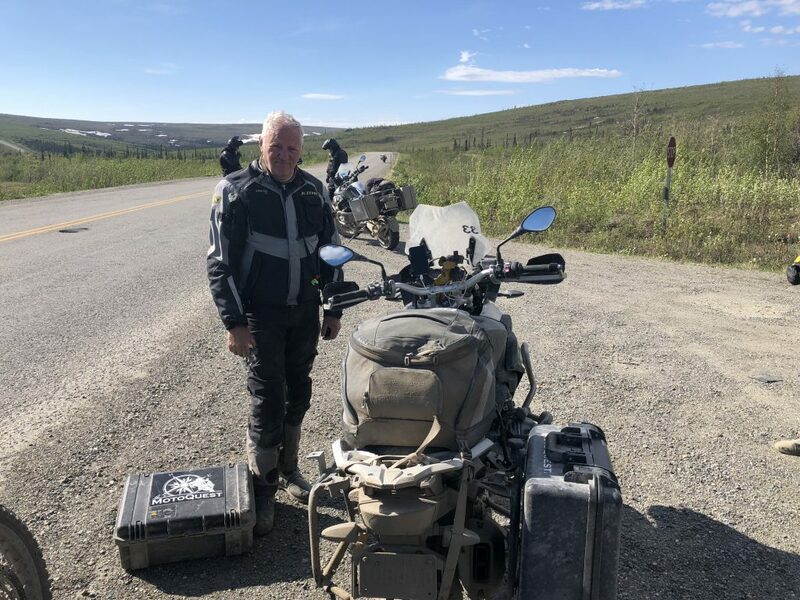 Rob indicated he wanted to mosy along, his throttle wrist had taken a beating so I rode at my own pace and we regrouped at the Yukon River Camp. Another round of the Credit Card, Fuel Pump, Photo and Pay line dance. We took stock over lunch. The morning had claimed about five rims on GS1200’s, a fork seal on a GS800 and a screen had broken it’s mounts on a Wee Strom and we all felt like we’d been thrown in a blender. It was generally agreed that the road back today didn’t seem like the same one we rode up on. The noodle soup was really good though. There was a bit of confusion when it was time to leave. My KLIM jacket was not where I left it near where I was sitting. I asked the staff and someone had handed one it. I put it on and my wallet, phone and passport were not where they should have been in the jacket. After a freak out moment I went outside and spoke to Dan. After some discussion and searching pockets we swapped jackets, he’d picked mine up and put it on. He claimed it was an accident but I wouldn’t be surprised if he set me up. I’ll never know for sure. 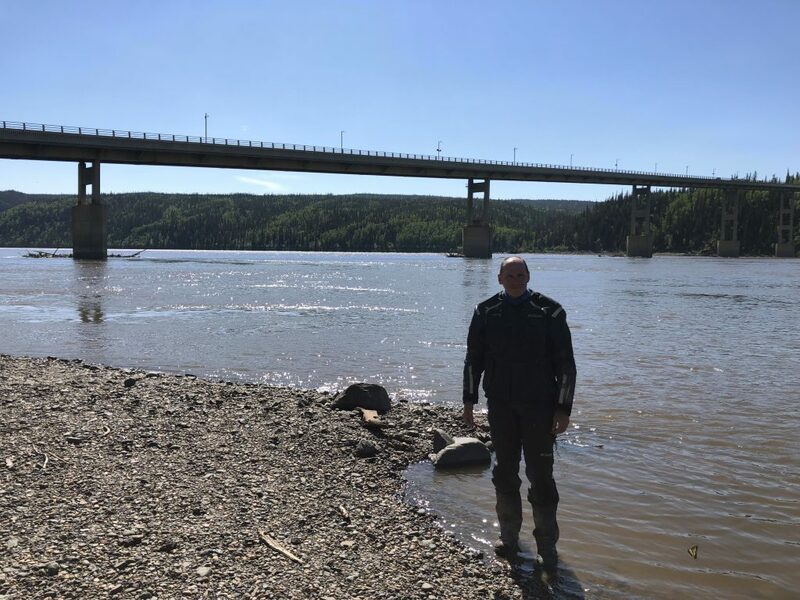 Before leaving there we took a couple of photos of the Yukon River Bridge, it was too long to get in one shot! 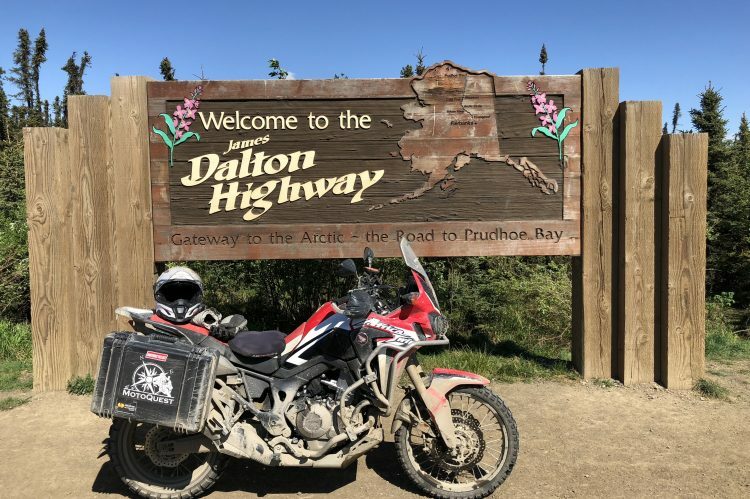 On the way out we didn’t give the Arctic Circle sign a second look but did stop at the Dalton Highway Sign. We’d made it out! You can see the fork oil on the rim in this photo. 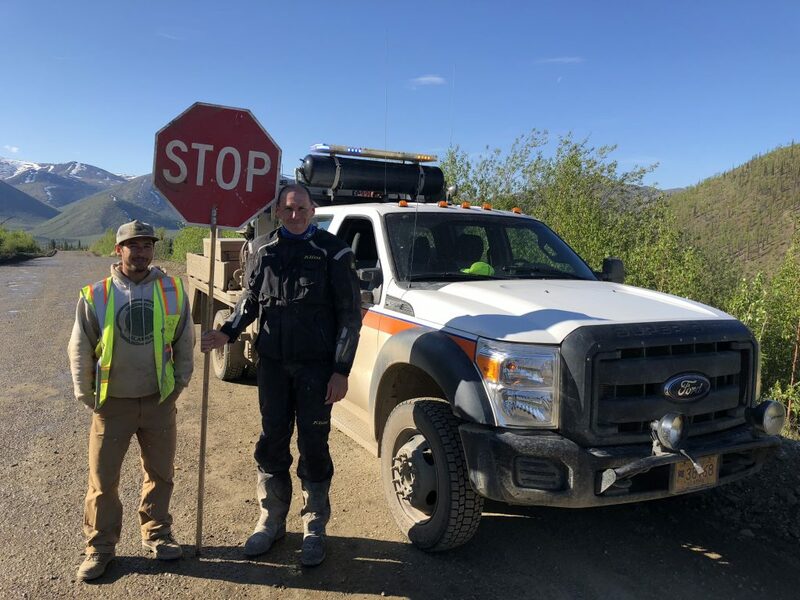 Now back off the Dalton Highway the road became mainly tar but there was still plenty of roadwork to cope with. They love their water trucks! 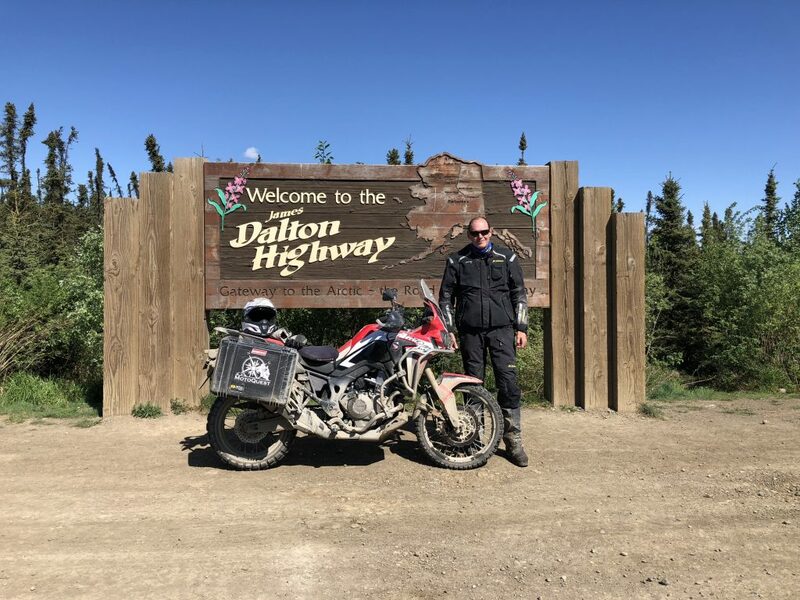 119 Miles (191 km) after we left Yukon we stopped at the Hilltop Gas Station which also had a bottle shop so we filled up the bikes and filled up the panniers. 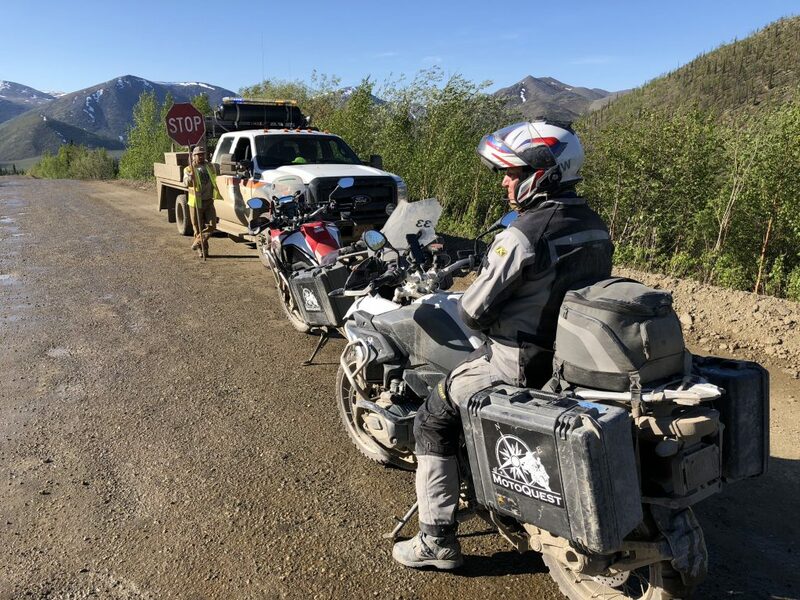 We were there for a while just chatting and waiting for others and also not sure of the mobile reception at our overnight destination we were all keen to see how the injured rider from yesterday was faring in Anchorage Hospital. There were a few things on his list but he was going to be OK. 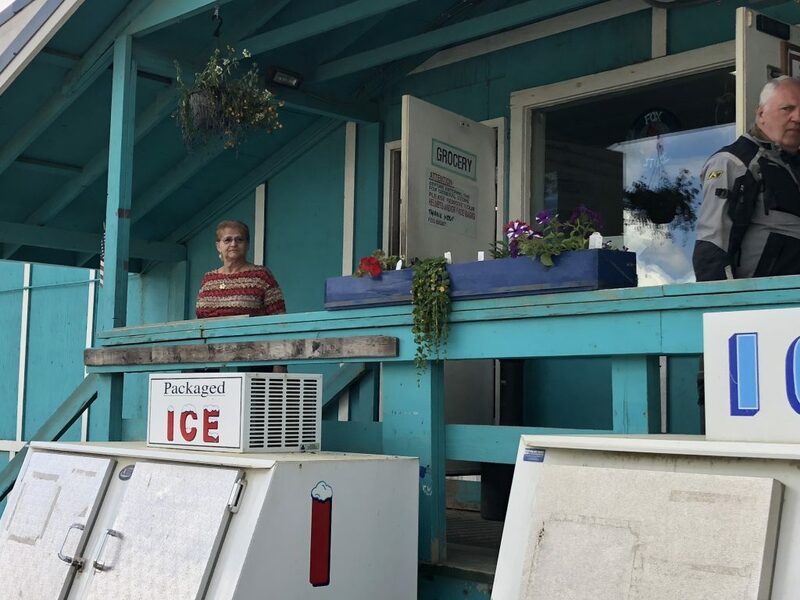 The lady running the gas station was a hoot! Chena Hot Springs was only 66 miles (106 km) from Hilltop. It was a nice road in, a few corners here and there and for now we were riding tar for a while. 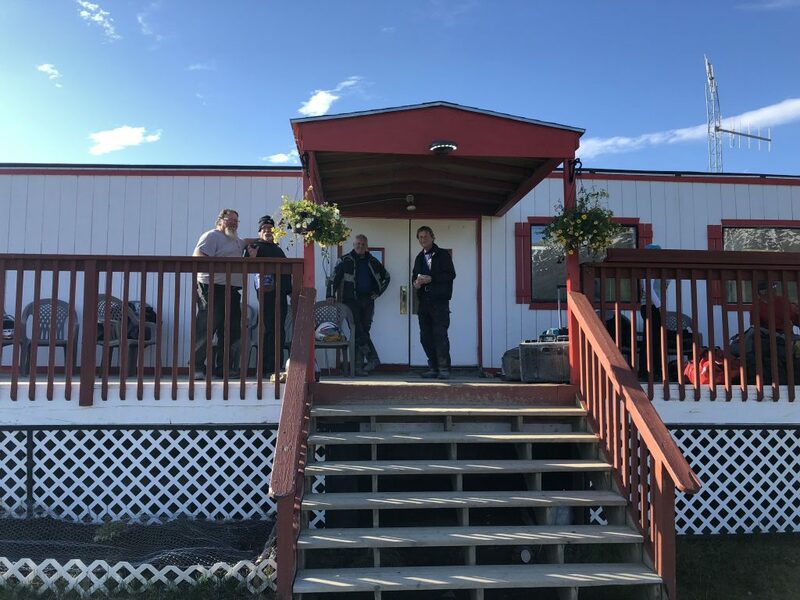 It was a big resort, we stayed in the Moose Lodge. It was definitely a step up from the camps we’d been staying at for the last few nights. The long hot shower in a spacious bathroom was very welcome. 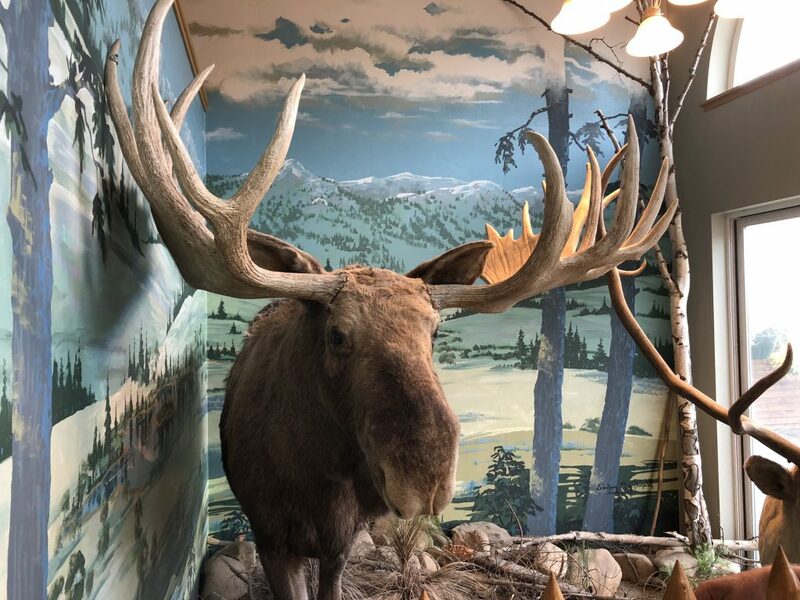 I guess this is why they called it Moose Lodge. We had dinner as a big group in the restaurant. The service was a bit dodgy, the food was reasonable but the company and debrief of the day was great. We’d missed the opening hours of the Ice Museum. Some of the group went to relax in the hot springs while others, including Rob and I, got together and relaxed by emptying some of the weight out of our restocked panniers. The other thing that was welcome were the blackout curtains in the room. So while the sun still wasn’t going to set tonight we were going to sleep in darkness.